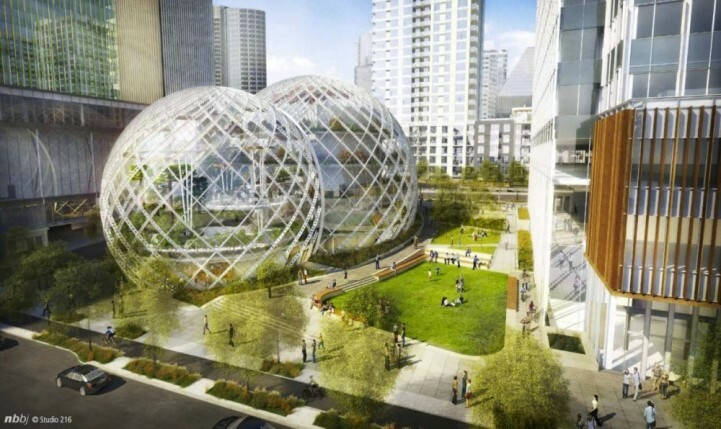 Amazon has just revealed plans for their brand new headquarters in Seattle, Washington. Designed by architecture firm NBBJ, the concept is slated to consist of three, five-story-high glass biodomes. The transparent globes will house retail, dining, and work space, along with various unique botanical zones from around the world. By incorporating a natural setting in the work environment, employees will feel more relaxed and happier. "The generative idea is that a plant-rich environment has many positive qualities that are not often found in a typical office setting,” states the design brief published by NBBj.